Dwyane Wade’s retirement tour came to New York for the final Madison Square Garden game of his career. In 27 minutes off the bench, he dropped 16 points, collected seven rebounds and even got a block and a steal. The Heat won the game 100-92 and Wade literally kissed the court goodbye after the final buzzer, planting a smooch on the center court logo. It was a cute moment if you’re into that sort of thing. But for at least one player, the positive feelings ended soon after the postgame pomp and circumstance did. Knicks guard Emmanuel Mudiay, who scored a respectable 24 points on Saturday, thought he’d try and join in on the season-long tradition of some player getting to swap jerseys with Wade. The Miami guard replied with a quick “nah” and said he already had someone to give it away to. To make matters worse for Mudiay, the whole cringe-worthy exchange was picked up on a broadcast’s audio feed. There’s probably a good reason as to why Wade didn’t just hand out the jersey from his last ever MSG game to the first person who asked after the game, but even a made-up excuse to not hand the jersey over to Mudiay would have been acceptable—especially since Mudiay probably would have been the worst player to get one. 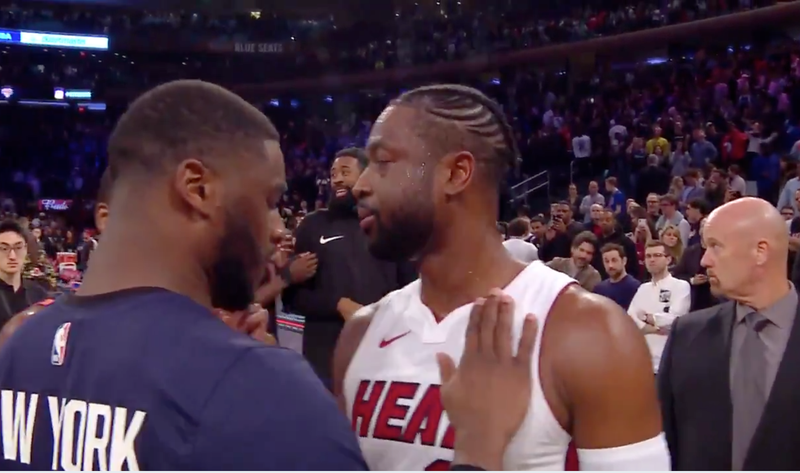 Regardless, I’m not sure what’s more awkward about the clip: the rejection itself, or the fact that Mudiay kept his hand on Wade’s jersey for a few extra seconds after getting told no.